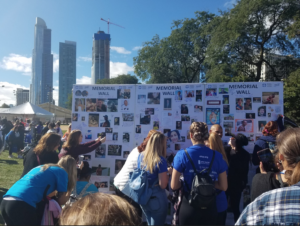 Chicagoans gathered Saturday in Grant Park for the annual Out of The Darkness Walk to support those struggling with mental health and those who have lost a loved one to suicide. Out of The Darkness is a national fundraising movement sponsored by the American Foundation for Suicide Prevention (AFSP) which was founded in 1987. The event attracted 6,753 people who came to show their support at the Chicago event, according to AFSP’s website. It’s been holding Out of The Darkness events in all 50 states for 15 years, according to co-chair for AFSP’s Illinois chapter Steve Moore. The event began at Arvey Field in Grant Park at 9 a.m. and ended at 1 p.m. The radio station 100.3 Chicago set up and played music for the event while supporters walked around the tents set up on the field. The walk itself started at 11 a.m., giving participants a chance to explore the exhibits set up for the day. The main tent had projectors displaying images of loved ones who have committed suicide while family members shared their stories and offered words of comfort to those struggling. A variety of other tents were set up and included stories from survivors, mental health counseling, comfort dogs for people to sit down and pet, fake tattoos, merchandise and honor beads. The color of an individual’s honor beads indicated the walker’s personal connection to the cause. There were nine colors in total: white (loss of a child), gold (loss of a parent), red (loss of a spouse/partner), blue (support for the cause), teal (know of someone struggling), orange (loss of a sibling), purple (loss of relative or friend), silver (loss of first responder/military) and green (personal struggle/attempt). AFSP had also set up a ‘Why I Walk’ board for supporters to write on and explain their reasons for coming out to the event. Many supporters wrote about walking for lost loved ones and a desire to end stigma so those struggling can ask for help. “I walk to create awareness and inspire hope for those who struggle with suicide and are too proud or afraid to ask for help,” read one quote on the wall. The walk continued past the museum campus and north on the lakefront trail before looping back near Randolph Street. Second year medical students from Loyola’s Stritch School of Medicine Keats Ewing and Lisa Laurenzana came to support the cause and were wearing blue beads. They explained they struggled with the stress of medical school and their friends have as well. “Med students have a pretty high risk of suicide and it’s something we really need to have a conversation about. It’s not something you really want to talk about but this walk helps,” Ewing said. Ewing said he’s also an emergency medical technician and explained many of the calls he’s responded to have been related to mental health in some way. “We just thought it would be good to come here and show our support. 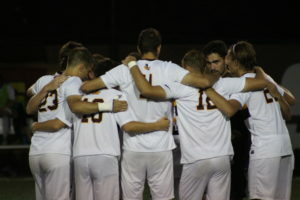 It’s definitely been emotional,” Laurenzana said. 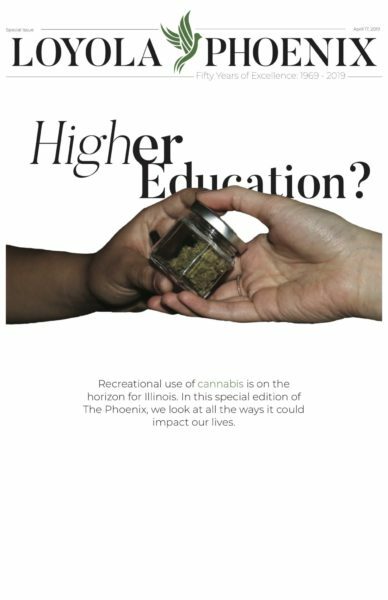 Two Loyola students committed suicide last year, The Phoenix previously reported. Marketing student Dylan Balogh died Oct. 28. Balogh struggled with anxiety and depression and tried to help others struggling, his mother told The Phoenix. Balogh’s family also requested donations be made to the Out of The Darkness Walk, The Phoenix previously reported. Senior software engineering student Kelly Herron died March 4. She was close to graduating and loved pizza, her family said. Suicide is the second leading cause of death for people ages 10-34 and 64 percent of college students who leave school do so for mental health reasons, according to a report from the AFSP. Around 8 percent of college students have seriously considered suicide and 0.9 percent of them have attempted, according to a 2015 study by the Centers for Disease Control and Prevention mentioned in the report. Out of The Darkness Chicago exceeded its original fundraising goal of $900,000, raising $926,759.65, according to the AFSP website. Moore said he hopes the walk will raise over $1 million for mental health research and support. He also said the walk is pivotal in breaking the silence and stigma around mental illness. 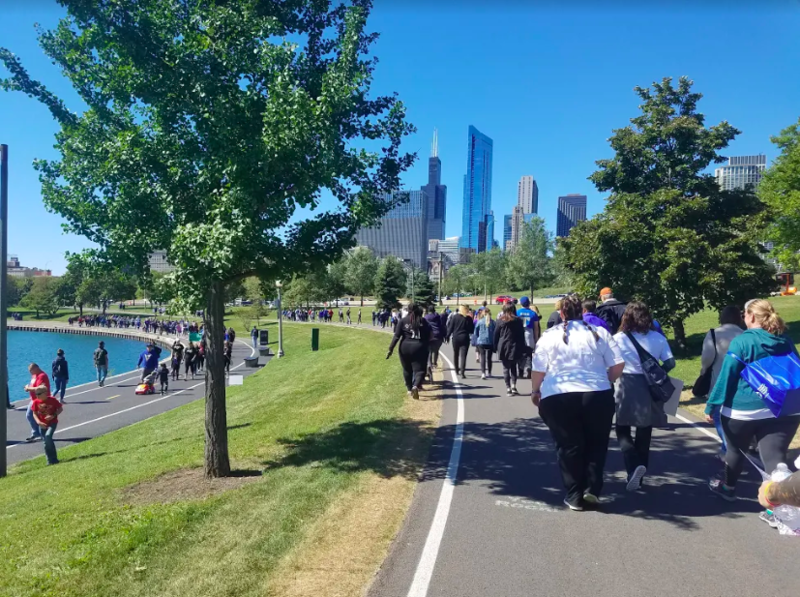 The AFSP hopes to use these walks to reduce stigma of suicide and help achieve its goal of reducing the annual suicide rate in the United States by 20 percent by 2025, according to AFSP. The AFSP cites the most recent suicide rate as 13.42 people per 100. Suicide is also the 10th leading cause of death in the United States, according to the AFSP. Last year, the AFSP granted $4.65 million to researchers looking into suicide prevention and mental health, according to its website. That money comes from donations collected from the Out of The Darkness walks and other public education events, according to its website.